Fee's Little Craft Studio: Off to the Gathering Tomorrow !!! 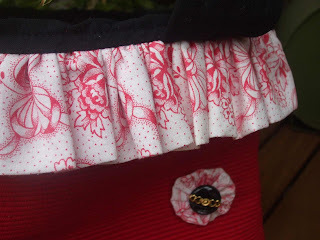 I have been finishing a few of the designs I started a few months ago - This is a little sneek peek at a bag made from a place mat - It is made using some recycled fabric too so a real "frugal" project for gift giving. 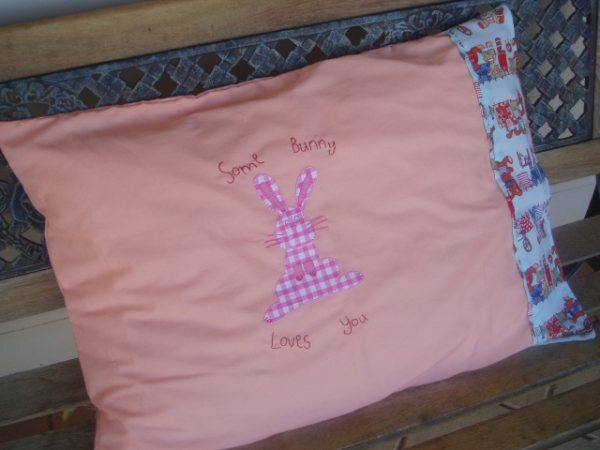 How are you going with the bunny stitchery? Have you had time to do anything with it yet? Here are just a few of the items made using him. This pillow was made by Bev for her daughter for easter - It's so pretty. And this lovely gift tag was made by Sandra - She reduced the stitchery down to tag size - Isn't she clever - What a great trim for her basket. 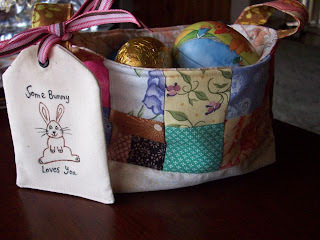 It is not long now until Easter Bunny visits. I am making all of the chocolate gifts for the littlies this year - All of this cost $15.00 - Chocolate, Moulds, Bags & Ribbon. It is much better value than the commercial ones which just seem to get thinner and lighter and more expensive each year. I will have the moulds for next year to re-use again. Spotlight have a great range if you are also thinking of making your own? Well Ihad best be off - My beloved Geelong Cats play tonight so I have to get comfy with my stitching on my lap to watch them win !! Have fun tomorrow sweetness... can't wait to see the finished results.. Enjoy the gathering ... looking forward to seeing some lovely 'bird' projects soon. Have fun on the weekend and I hope your team wins ! Have fun this weekend and good luck! Have a grand time, Fiona! I made a placemat purse once but it didn't have a sweet ruffle. 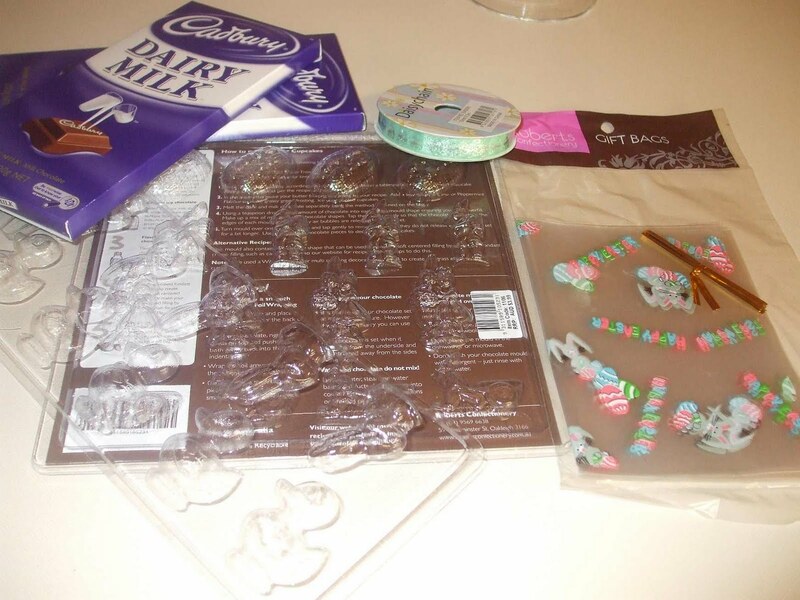 The bunny projects are great, have fun making candy - that really sounds fun!